Mek SpiderEye Machine Vision systems deliver instant improvements to any manufacturing process via the development of totally automated processes. Inspection and quality control tasks traditionally performed by humans or inflexible mechanical procedures can be fully automated for increased throughput, lower defect counts and to generally boost productivity and profitability. Authoritative studies clearly show operator efficiency in recognising faults reduces by up to 25% near the end of a standard shift. In addition, the time taken to complete specific tasks degrades by over 50% after four hours. For visual inspections that require high-speed, continuous operation and/or repeatability of measurement, Machine Vision is fast becoming the technology of choice due to the increasing quality demands of manufacturers and customers. 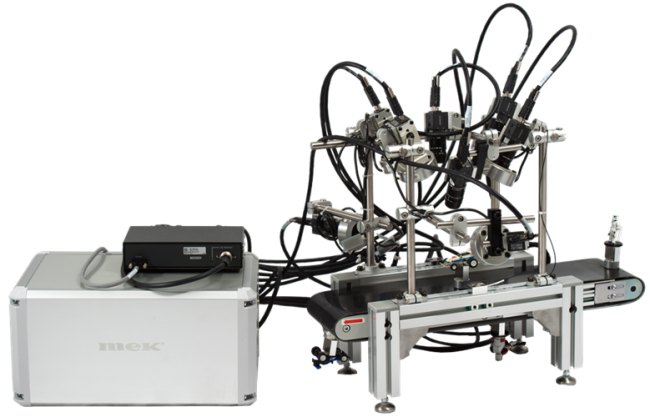 Ideal for small-spaced assembly lines, Mek SpiderEye Machine Vision systems are affordable, easy to use and totally flexible to handle short runs, repetitive tasks and ergonomically challenging jobs.